The opening round of the Jaguar Classic Challenge, organised by the Historic Sports Car Club, was one of the star races at the eighth Donington Historic Festival (4-6 May). From a superb 37-car field, Julian Thomas and Calum Lockie overcame two penalties and strong opposition to win the hour-long race. 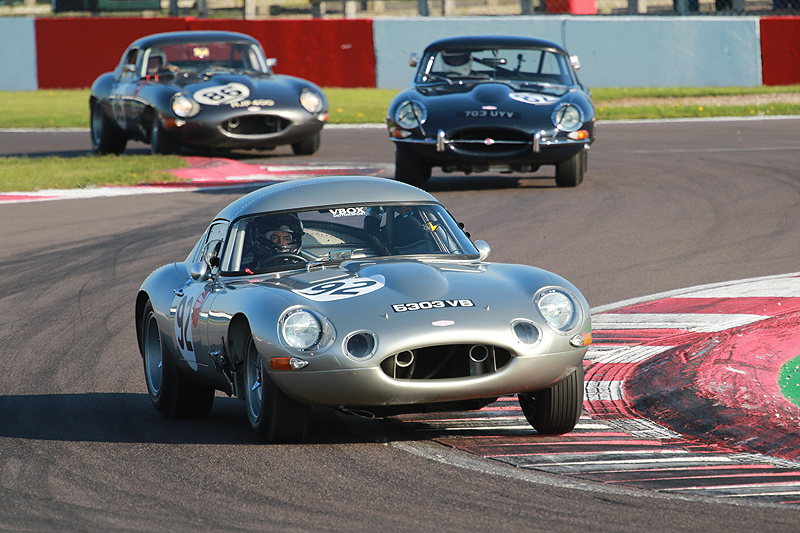 Heading into its fourth season, the Jaguar Classic Challenge is managed by the HSCC and is a fitting way to honour Jaguar’s outstanding sporting heritage. Ben Short belied his limited experience at this level to set pole position by just five-hundredths of a second from the E-type shared by brothers Gary and John Pearson. Well within half a second on the pole time were the cars of Graeme and James Dodd and Thomas/Lockie. While the E-type was easily the most popular model on the grid, several earlier cars, including the MK1 saloons of Diane Osborne and Roger Cope and a clutch of XK120s and XK150s provided variety. Chris Keith-Lucas shared his road-going XK150S with his wife Claire, with the car arriving fresh from completing a seven-day, 1000-mile tour of Northern Spain. “We polished it and changed the tyres,” said Keith-Lucas of converting the 60-year-old car back into race trim. From the start, the E-type of Short rocketed away as Thomas and Gary Pearson gave chase. Short set a fearsome pace to build up a handy lead towards the opening of the pit-stop window. However, Short’s lap times started to fade mid-race as the ambient and cockpit temperatures took a toll. “I physically ran out of steam,” he later admitted. Meanwhile, Thomas handed his car over to former British GT champion Lockie. They already had a 10-second penalty for a false start and things got worse when they were judged to have been too quick during the pit stop. Lockie had rejoined in the lead and was still able to retain the lead despite taking a drive-through penalty. “I thought we’d lost it but then I realised it was still possible,” said Thomas. Short battled on in second place but had John Pearson, who had taken over from his brother Gary, in hot pursuit over the final laps and only eight-tenths of a second split them at the flag. “It was very warm in there,” said John Pearson. Gary Pearson also took fourth place in the E-type he shared with Carlos Monteverde, while Vincent Gaye and former BTCC/Le Mans racer Anthony Reid took fifth from Jamie Boot. A class D-winning seventh was the standard E-type of British GT contenders Jon Minshaw and Phil Keen, while other class victories fell to Grahame Bull/Alan Bull (E-type), Paul Kennelly (XK 150S) and Jay Shepherd/Rod Barrett (D-type).